In an increasingly busy world, a minimalist color palate can speak volumes. 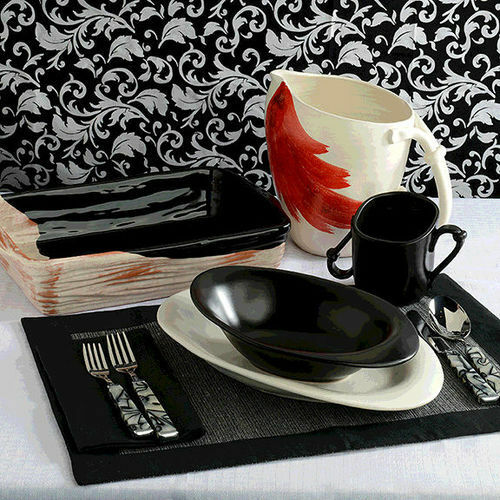 Black and white with a splash of color is having a moment, especially in tablescapes. The trend is one of the oldest color combinations in design history, but also one of the most modern looking and the most striking. Season after season, this high-contrast design trend manages to keep tablescapes looking both fresh and classic. Black and white are highly-contrasting colors, making them visually striking without being too harsh. Within the context of this color combination, the unexpected addition of an accent color makes color the story of the design scheme. So adding a touch of crimson to your black and white design makes even a small amount of red the dramatic focal point of your dinner table. And the fact that this color story always looks fresh year after year means that you don’t have to worry about dated-looking tablescapes. One of the biggest advantages of choosing a black and white color scheme is that it allows you to easily shift the look and feel of your tablescapes by swapping out accent colors. The classic color combination of black and white with a red accent can be transformed by switching out the red for blue or green, giving your tablescapes a completely different feel with minimal effort and without having to invest in a whole new collection of pieces (not that there is anything wrong with collecting new pieces!). The powerful combination of black and white design with a striking red accent is the defining characteristic of Modigliani’s most modern collection La Forma del Sogno-Rosso. Join us in celebrating the timelessness of this minimalist color combination by shopping our collection and sharing your favorite tablescapes with us on Twitter and Facebook.